A few months into orthodontic treatment with braces, my teenage daughter’s gums are now quite swollen. Is this normal? Orthodontic treatment can indeed make a dramatic improvement in your smile; yet it can also increase the risk of gum disease. This is especially true with fixed appliances, commonly known as braces. Because they cover much of the tooth surface, braces make cleaning the teeth more challenging. The “hardware” of braces includes small metal or plastic brackets that are attached to the teeth, and metal bands that go around, and are cemented on to them. Both of these provide the little tracks through which the arch wires are placed (the wires that actually make the teeth move); and both can contribute to gum changes. This problem is actually twofold: First, as your daughter has no doubt experienced, all the paraphernalia just make the teeth more difficult to clean; it compounds the trouble of biofilm stagnation and removal. Second, sometimes the gum tissues just don’t like the proximity of the braces and react by swelling and/or overgrowing. These two issues tend to work together and compound one another. Biofilm, also known as dental bacterial plaque, can cause both gum disease and tooth decay. Removing this biofilm by brushing and flossing is the best way to prevent these diseases from getting started during orthodontic treatment. Hormones, which are often beginning to surge just when braces go on, can also have a dramatic effect on gum disease; for example, women often develop gingivitis during pregnancy or when taking birth control pills and girls may have a similar reaction during puberty. Biofilm that is not removed effectively on a daily basis will cause inflammation of the gum tissues, which is known as gingivitis. This condition is characterized by swelling, redness and bleeding when brushing, and is an early stage of periodontal disease (“peri” – around; “odont” – tooth). It can lead to detachment of the supporting structures of the teeth, and can be quite destructive, especially when the teeth are being moved orthodontically. In addition to gingivitis, the gum tissues can react to the braces by causing hypertrophy (“hyper” – over; “trophy” – growth of individual cells) or hyperplasia (“plasia” – increase in the number of cells). Either way, what you notice as swelling of the gum tissues gives the smile an unusual appearance. What’s worse, as the gums swell, the teeth become even more difficult to clean, leading to a vicious cycle. That’s why it is preferable to stop excessive gum growth in its early stages. The good news is that these conditions are usually reversible. But first things first — it is important to be extra diligent about daily oral hygiene practices especially when you’re wearing braces. Beyond tooth brushing, a variety of aids have been designed to help remove biofilm effectively during orthodontic treatment. These include floss threaders (small probes that help get dental floss under wires) and interproximal brushes (tiny brushes that can fit in the spaces between teeth). Ask your dental hygienist, dentist or orthodontist about which ones may be most suitable in your case. Most importantly, ask them to demonstrate how to use these aids. Water irrigators (water flossers) and electric toothbrushes can also be effective aids in plaque removal. They may be ideal for someone who’s a “gadget” person or those individuals who have a difficult time with oral hygiene. Many of these devices also have additional features like built-in timers (to help ensure that they are being used for the appropriate amount of time), and special brush heads/tips that help navigate around orthodontic appliances. In addition to mechanical devices, mouthrinses (either prescription or over the counter) may sometimes be recommended to help control biofilm buildup. You should also continue to have regular dental cleanings during orthodontic treatment, sometimes as often as every few months if these conditions are problematic. If these simple routine measures are only partially helpful (or not helpful at all), your general dentist or orthodontist should give you further advice. 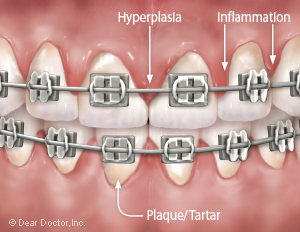 Sometimes, hypertrophic or hyperplasic gum tissue will not resolve until after the braces are removed. Generally, as long as there is no detachment of the periodontal tissues from the teeth, you probably don’t need to worry. However, you should be carefully and regularly monitored by the dental health professional who is doing the orthodontic treatment. Indeed, he or she may elect to send you to a periodontist (a specialist in the diagnosis and treatment of disorders and diseases of the supporting structures of the teeth) for help while you are in braces. In severe cases of gum swelling during orthodontic treatment, it may be necessary to remove the braces and allow gums to heal, or the gum tissues may need surgical correction. Thanks for pointing out this important issue and don’t hesitate to bring your concerns to your daughter’s general dentist or orthodontist. They can make sure the condition is diagnosed and treated effectively.